More importantly than zero emissions and saving the planet and all of that stuff, electric cars have a lot of torque. That means they can accelerate like small land rockets that’ll make you lose whatever you ate last, but apparently not everyone wants that in a car. Weird. The excerpt doesn’t include details about just how chill the new Chill mode will be, only that it’ll be “smoother” and “gentler” than usual. Jalopnik has reached out to Tesla for the full release notes, and will update if we hear back. 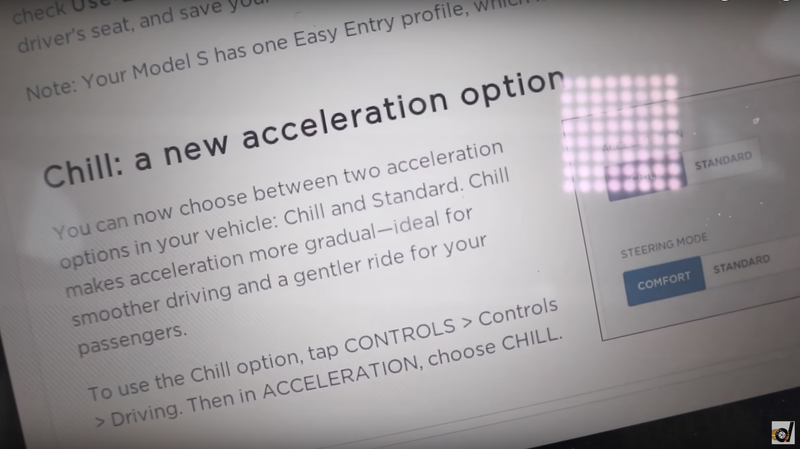 Chill mode sounds like the exact opposite of Tesla’s Ludicrous mode, which lets drivers make the car even faster. A Model S P100D went from 0 to 60 mph in 2.389 seconds in Ludicrous+ mode at the start of the year, and those three decimal places matter—that time just barely beat Faraday Future’s 2.39 seconds in its FF 91 electric car. But it seems like Tesla’s realizing not every wealthy lawyer wants to go from 0 to 60 before they know it on the way to their large home in the suburbs, and not every passenger wants to relive those Gravitron carnival rides in the back seat. There’s no fun in that, but everyone has a different definition of fun, it seems.